Wickliffe FLOWER BARN LLC has recently expanded and in addition to FLORAL ARRANGEMENTS using the freshest flowers available for any occasion, we NOW offer Backroad Vintiques: our select Antique and Vintage Furniture and Collectibles at fair and reasonable prices...We're not your typical dealer, prices are negotiable and our intention is to pass on great deals to you! So go ahead, make an offer, we encourage it...in fact we love to negotiate! 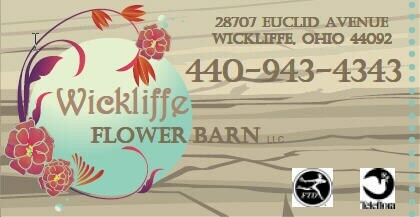 Let Wickliffe Flower Barn llc. be your first choice for flowers. *Our shop is open from 8:00 a.m. to 5:30p.m., Monday through Friday, 8:00a.m. to 5:00pm Saturday and from 8:00 a.m. to 1:00 p.m. on Sundays. To help assure on-time delivery during the busy holiday season, place your order at least 1 day prior to the following major holidays: Thanksgiving Day, Christmas Day, New Year's Day, Valentine's Day, Easter, Administrative Professionals Week, Mother's Day, Memorial Day, Father's Day, Independence Day and Labor Day. Thank you! Our shop will always be closed for orders other than Funeral Arrangments on the following holidays: Thanksgiving Day, Christmas Day, New Year's Day, Easter, Mother's Day, Father's Day, Independence Day and Labor Day. If you have any questions or need more information, please call us directly at TOLL FREE 1-855-746-4343. We're always here to serve you and make your flower-sending experience a pleasure. Wickliffe, Euclid, Cleveland, Mentor, Eastlake, Willowick, Willoughby, Willoughby Hills, Chesterland, Concord, Mentor on the Lake, Highland Heights, Mayfield, Mayfield Heights, Lyndhurst and surrounding areas. We will do our best to accommodate deliveries at specific times of day, but we cannot guarantee it. If you have any questions or concerns, please contact us directly at TF 855-746-4343.